Electric motor is a device that converts electrical energy to mechanical torque. In other words, the devices which produce rotational force are known as the motor. 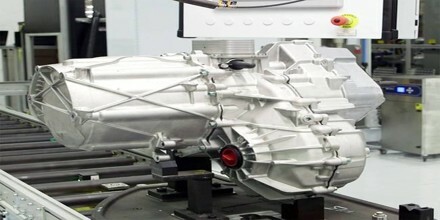 In certain applications, such as in the transportation industry with traction motors, electric motors can operate in both motoring and generating or braking modes to also produce electrical energy from mechanical energy. 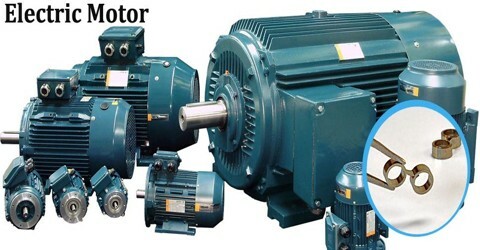 The working principle of the electric motor mainly depends on the interaction of magnetic and electric field.The electric motor is mainly classified into two types. They are the AC motor and the DC motor. The AC motor takes alternating current as an input, whereas the DC motor takes direct current. The largest of electric motors are used for ship propulsion, pipeline compression and pumped-storage applications with ratings reaching 100 megawatts. Electric motors may be classified by electric power source type, internal construction, application, type of motion output, and so on. 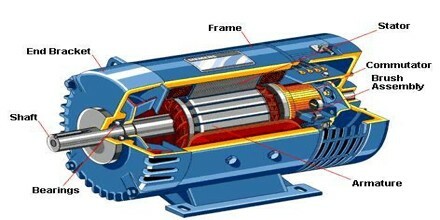 Electric motors are also used to produce linear or rotary force, and should be distinguished from devices such as magnetic solenoids and loudspeakers that convert electricity into motion but do not generate usable mechanical powers, which are respectively referred to as actuators and transducers. Electric motors work on the principles of electromagnetism. When charges are still, they create electric fields. But when charges move, they instead produce magnetic fields. A current in a wire, for example, produces its own magnetic field. This is what we exploit in an electric motor to create movement. When a current was passed through the wire, the wire rotated around the magnet, showing that the current gave rise to a close circular magnetic field around the wire. This motor is often demonstrated in physics experiments, brine substituting for toxic mercury. Though Barlow’s wheel was an early refinement to this Faraday demonstration, these and similar homopolar motors were to remain unsuited to practical application until late in the century. An electric motor contains a coil of wire that creates a magnetic field when electricity flows through it. This is collectively known as an electromagnet. It turns out that when a current flow through a magnetic field, the charges feel a magnetic force on them at 90 degrees to the direction they’re moving. Because of this, the wire as a whole feels a big force. And this force causes the loop of wire to move; electrical energy has been changed into movement. Among the four basic classifications of motors mentioned above the DC motor as the name suggests, is the only one that is driven by direct current. It’s the most primitive version of the electric motor where rotating torque is produced due to flow of current through the conductor inside a magnetic field. Its work depends on the basic principle that when a current carrying conductor is placed in a magnetic field, then a force exerted on it, and torque develops. The DC motor is classified into two types, i.e., the self-excited motor and separately excited. Separately Excited Motor: The motor in which the DC winding is excited by the separate DC source is known as the separately excited dc motor. With the help of the separate source, the armature winding of the motor is energised and produces flux. 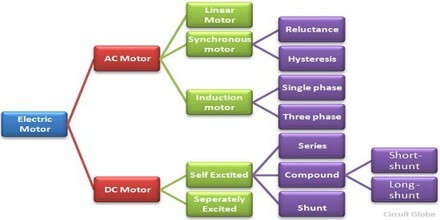 Self-Excited Motor: By the connection of field winding the Self-excited DC motor is further classified into three types. They are the series, shunt and compound wound DC motor. In another type of AC motor where rotating magnetic field cuts the rotor conductors, hence circulating current induced in these short circuited rotor conductors. Due to interaction of the magnetic field and these circulating currents the rotor starts rotates and continues its rotation. It is classified into three types; they are the induction motor, synchronous motor, the linear motor. Induction Motor: This motor uses electromagnetic induction phenomenon for transforming the electric power into mechanical power. According to the construction of rotor, there are two types of an induction motor. Namely squirrel cage induction motor and phase wound induction motor. Linear Motor: The motor which produces the linear force instead of the rotational force is known as a linear motor. This motor has unrolled rotor and stator. Such type of motor is used on sliding doors and in actuators. Synchronous Motor: The machine that changes the alternating current into mechanical power at the desired frequency is known as the synchronous motor. In the synchronous motor, the speed of the motor is synchronised with the supply current frequency. Electric motors operate on three different physical principles: magnetic, electrostatic and piezoelectric. By far the most common is magnetic.